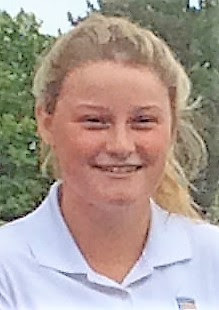 Aboyne's Shannon McWilliam, pictured, improved on her first round by 10 strokes with a brilliant, seven-birdie round of 65 to be the only Scottish qualifier for the match-play stages of the Spanish women's international amateur golf championship at Zaudin Golf Club, Seville. Curtis Cup international McWilliam, whose only bogey came at the ninth, birdied the fourth, fifth, seventh, eighth, 12th, 14th and 16th in halves of 33 and 32 to advance in joint ninth place with an aggregate of 140 of the 32 match-play qualifiers. Fellow Scots Connie Jaffrey (74-75 for 149), Hannah Darling (71-78 for 149) and Chloe Goadby (74-77 for 151) all failed to make the cut-off mark of 145. France's Pauline Roussin Bouchard was the leading qualifier with scores of 69 and 64 for 133.